Are you the Licensed Maid Agency? How long does it take to get a maid from overseas? What is the Maid Levy? How much is the maid levy? What are the countries Can I employ maid from? What is a security bond and how much is it? What are the alternatives available against the $5,000 security deposit? What is the Personal Accident Insurance? Do the maid need to undergo medical check ups and how often? Who bears the responsibility for medical expenses of the maid? How do Maid remit money to her home country? Can I employ a MAID on part-time basis? What do you mean by "Trasfer Maid"? What are the obligations of the employer to the Maid? Advise on obligations of the employer to the Immigration Department? What documents are needed for a first-time employer? What is the procedure of cancellation of the work permit? What is the average salary of a Myanmar maid? What is the average salary of a Filipino maid? What is the average salary of an Indonesian maid? What is the average salary of a Sri Lankan maid? Why should I approach a maid agency? Which countries can I employ a maid from? How to hide an existing maid. 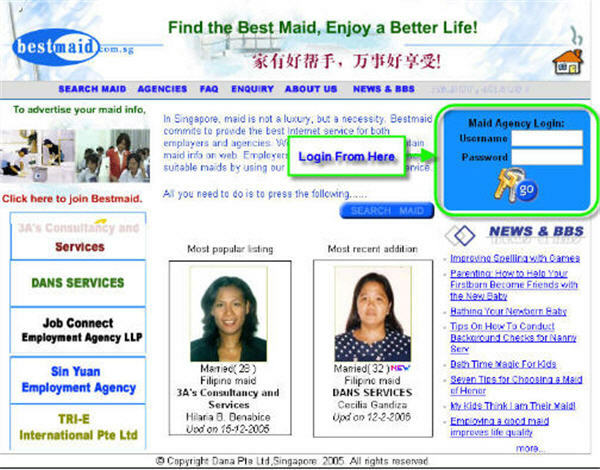 Why should maid agencies list maids at www.bestmaid.com.sg? How to add a maid? 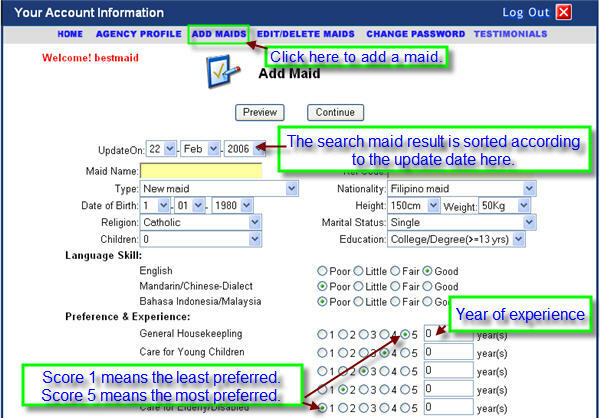 How to edit or delete the existing maid info? 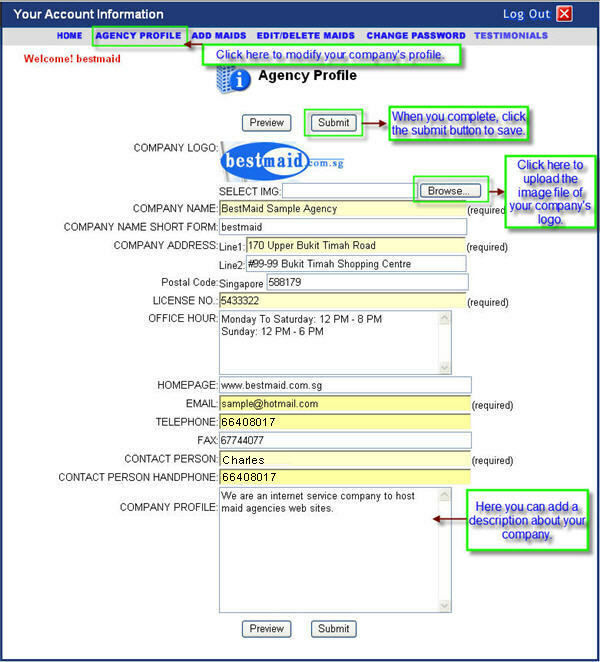 How to update your company profile? Because our maid agencies from Bestmaid provide selected, well trained and quality maids and we value the needs of our customers. Yes. 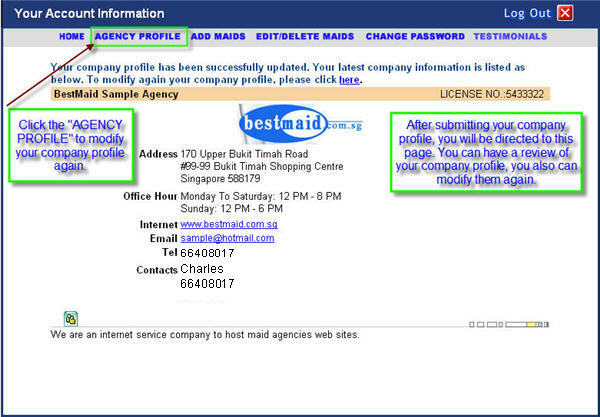 All the maid agencies listed at Bestmaid are Licensed. Ministry of Man Power issues the license to operate the Maids Recruitment and Deployment business. If the application is done in correct manner to process the Work Permit for the maid, it takes anywhere from one week to four weeks for maid to arrive and start working for the employer. It also depends on the country of maid in some cases. As per MOM (Ministry of Manpower) regulation, an employer needs to pay the maids levy, which is a kind of monthly tax, paid to government on every single foreign domestic worker employed in republic of Singapore. The Levy is $295.00 per month or $10 per day, payable for the period the work permit is valid. For Singaporean with young children below 12 or elderly living under the same household above 65 years of age, the government offers a concessionary rate of SGD170.00 per month. CPF Board, as the collection agent, collects the Levy on behalf of MOM. You can only employ maid from MOM (Ministry of Manpower) approved source of countries for FDW (Foreign Domestic Workers). The countries are: Malaysia, Philippines, Indonesia, Thailand, Myanmar, Sri Lanka, India and Bangladesh. Employer is responsible for the repatriation of the maid once the usual contract of 2 years expires unless it is renewed. You are required to post a security deposit (bond) of $5,000 for every maid with the Work Permit Department, MOM. If you fail to repatriate the maid after cancellation of her work permit, you risk losing the $5,000 security deposit (bond). Employer can purchase an insurance policy from ANDA or NTUC Income, which is much more cheaper alternative as compared to making the $5,000/- deposit. Yes, Within 14 days from the date of to Singapore, she must get herself examined by a certified medical institution and only if she passes her medical test as deemed to fit for working then she can work for the employer. Such medical examination is required every six-month for the medical screening, for VDRL, pregnancy, and HIV. As an Employer, you are liable to pay full cost of the medical expense, including hospitalization. So its better to have insurance coverage for hospitalization expenses for your maid. you are a married woman and has elected for separate assessment. you are married and your husband is not resident in Singapore. you are separated or divorced or widowed and living with your Unmarried child for whom you can claim child relief. Your maid would like to send her monthly salary back to her family regularly. You can engage remittance service from the following. Ace Orient Exchange Pte. Ltd.
You should cancel her work permit immediately to stop the levy payment. You are then given 1 month to locate and repatriate her. Otherwise, you risk losing the $5,000 security deposit. You must repatriate the maid immediately. Presently MOM regulation does not allow the part-time employment of maids. Transfer Maids are usually already available locally means they are not to be brought in from their country of origin. Mostly "Transfer Maids" are from another employer's and they are seeking a new employer for various reasons such as the expiry of 2 years contract or employers discontinuing the service of maid for whatever reasons. To pay her salary on a timely basis. To provide adequate food and suitable. To provide medical care (includes hospitalization). To give her the respect. To treat her as a human being. The obligations of the employer to the Immigration Department are stated clearly in the Security Bond. 2. and a statement from CPF showing his contribution for the last 3 months, if applicable. 1. A letter to MOM for terminating maid's services and repatriating her. 2. A ticket to the maid's country of origin. 3. 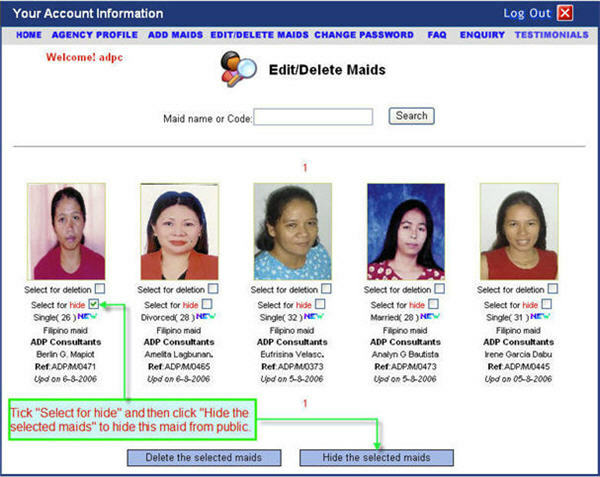 Maid's passport copy . 4. Maid's work permit card. Singapore Dollars 280.00 to 320.00. The more the experience, higher the salary. The Philippine Overseas Employment Administration's stipulated minimum salary of Singapore Dollars 350.00. The more the experience, higher the salary. Singapore Dollars 220.00 to 250.00. The more the experience, higher the salary. Transfer maids refer to those maids who have are currently staying in Singapore. Transfer maids can be interviewed in person. New Maids refer to those maids who are currently not staying in Singapore. Even if they have worked in Singapore or other countries, they are still classified as "New Maids" as long as they are currently not in Singapore. Maid agencies provide you professional and comprehensive service in maid recuitment and employment. A maid agency saves your a lot of effort in maid training, Work Permit application, security bond, insurance, travel arrangement, immigration clearance, medical screening, etc. You can employ a maid from Ministry of Manpower (MOM) approved source of countries as a Foreign Domestic Worker (FDW). The countries are: Malaysia, Philippines, Indonesia, Thailand, Myanmar, Sri Lanka, India and Bangladesh. 3. you are separated or divorced or widowed and living with your unmarried child for whom you can claim child relief. If you want to hide an existing maid due to whatever reasons, such as this maid is reserved, or this maid is blacklisted, etc, you may use the "Hide this Maid" function to hide this maid from public. 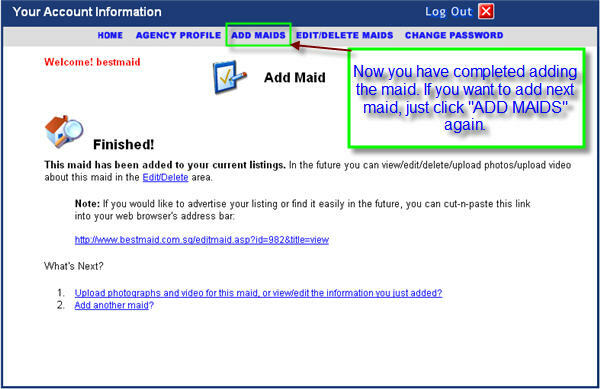 After you login your agency account, click "EDIT/DELETE MAIDS", and then under the maid you want to hide, you can click "Select for hide", and then click the "Hide the selected maids" button. The details are shown in the following figure. You still have access to the hided maids. 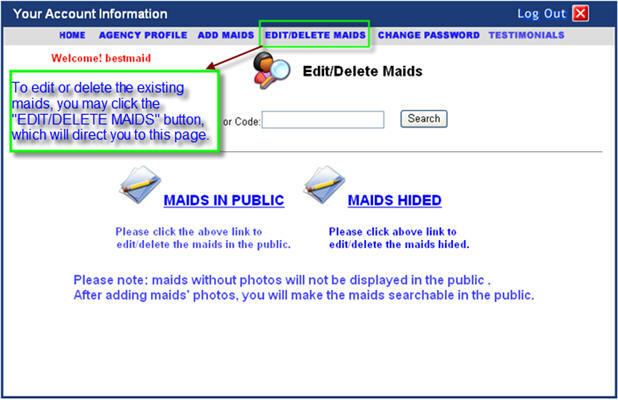 You can click "EDIT/DELETE MAIDS", then click Maids Hided, as shown below. 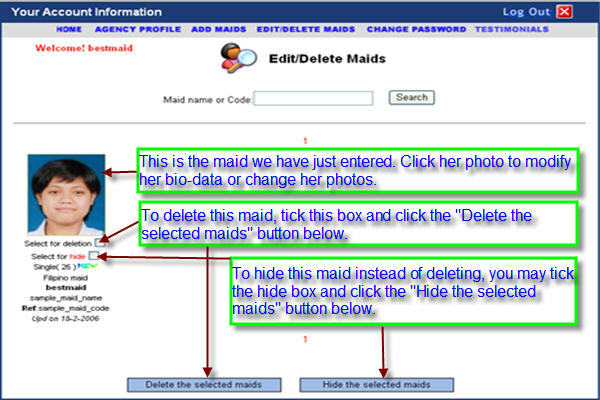 Now you can select the hided maid for deleting or un-hiding, as shown below. It is all about looking for maid employers! We actively advertise at the TOP 3 search engines: Google, Yahoo, MSN. We help bring more potential employers to you. For more details, please read the following facts: Successful Secrets. 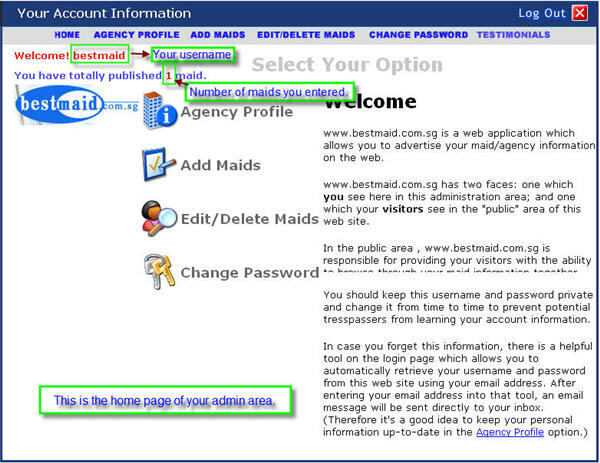 To take a tour to our service, please login bestmaid using the following username and password for a trial. 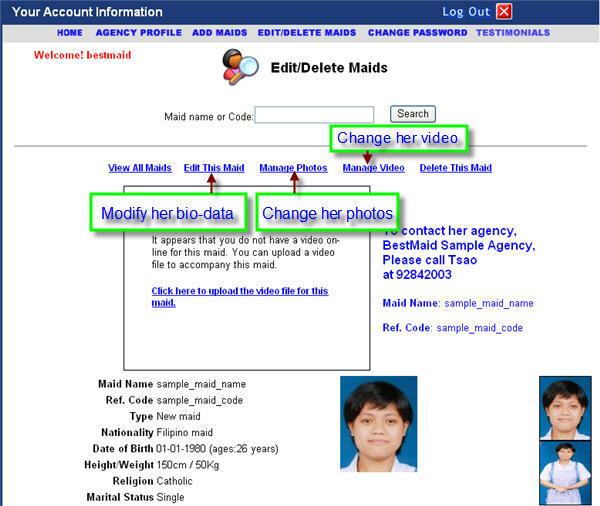 After login, you can try to addd/edit/delete maid's bio-data, photos, videos. It is full of fun! 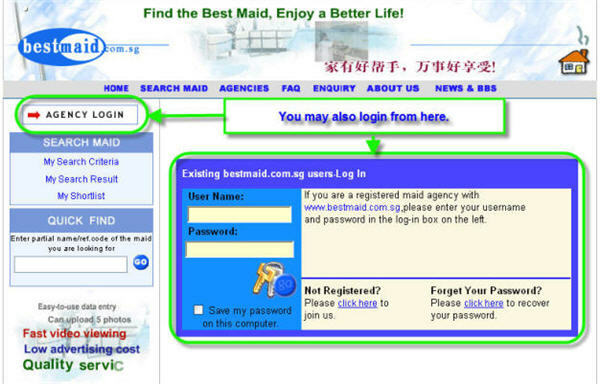 There are two ways to login bestmaid.com.sg. After you login, you will see the following homepage as your administration area. Here you have various options to manage your account, you can click ADD MAIDS, EDIT/DELETE MAIDS to add/modify/delete/hide maids, you can also click COMPANY PROFILE to update your company profile. You can click CHANGE PASSWORD to change your login password. To add a maid, you can click "ADD MAIDS" at the top bar menu. You can fill in the maids'bio-data, including name, code, nationality, height, weight, english level, experience, perference, etc. You may also add a complete introduction about the maid. After entering her bio-data, you can add her photos (up to 5 photos). The first photo is always the passport-sized, i.e., 100 (pixel) x 125 (pixel). The next photo is the full-sized. Once you have submitted the photos, you can submit a video file. 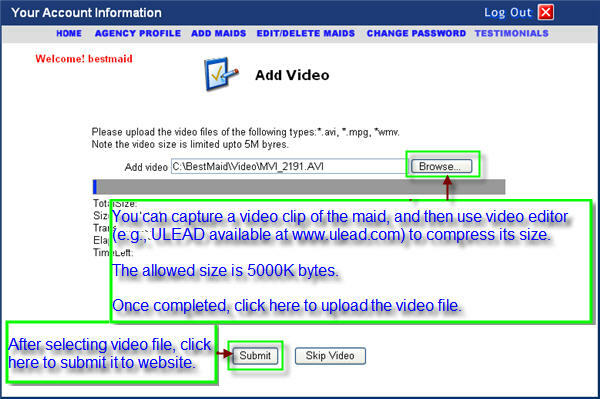 The video file taken should be compressed by professional video editor, e.g., ULEAD (available at www.ulead.com). Now, finished adding a maid. You can click "ADD MAIDS" again to add another maid. 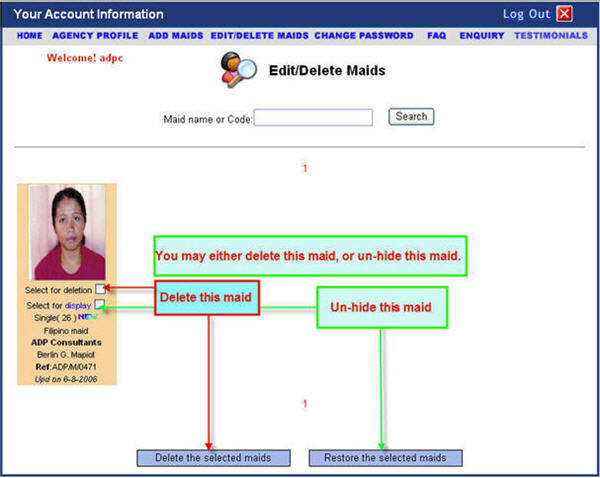 Once you have added a maid, you will be able to edit or delete the maid info at any time. 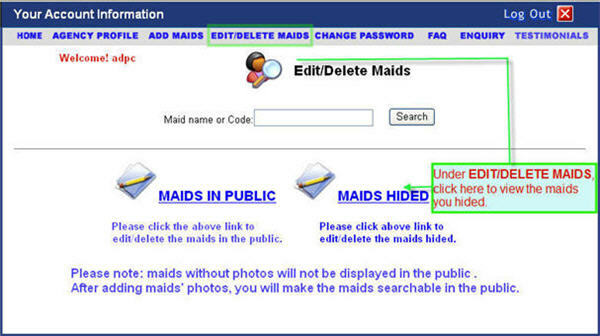 To edit, please press the EDIT/DELETE MAIDS button. After you click the MAIDS IN PUBLIC (or MAIDS HIDED), you will see the following page, where you will be able to edit or delete the maid info. When you click her photo, you will see the following page. 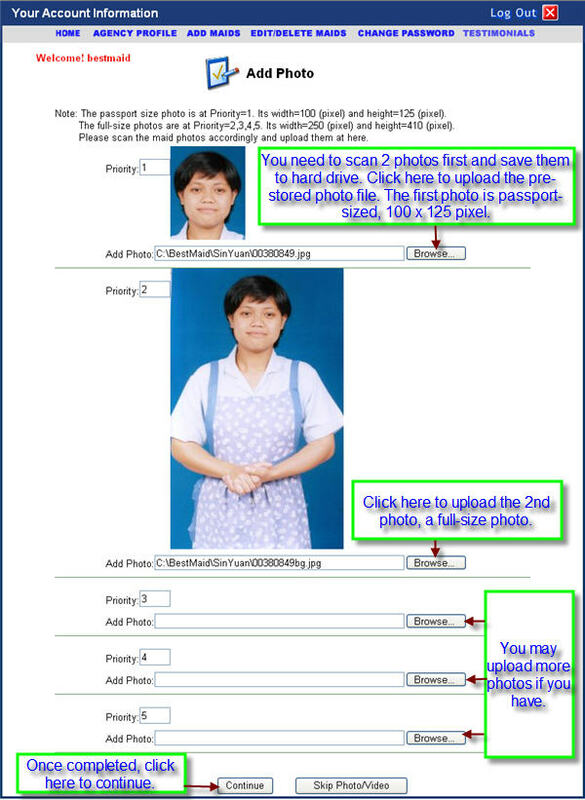 Here you can click the links shown below to (1) modify her bio-data (2) change her photos, or (3) change her video file. 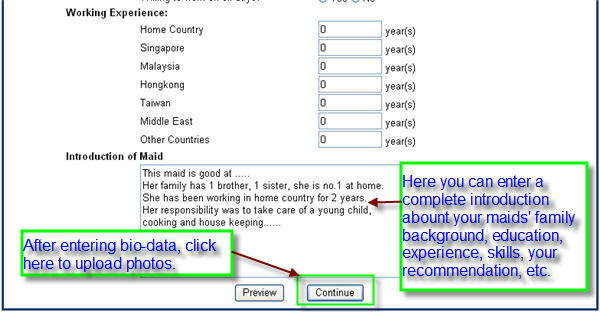 You may also click the links to return to your maid listing, or delete this maid. You can click COMPANY PROFILE from the top bar menu. you will see the following page, where you can update your company profile. After you have submitted your company info, you will see the following page for your to review your latest company profile. If you wish to modify it again, you can click the COMPANY PROFILE again.